One deep penetration site aims to document the early stages of Himalayan erosion, the India-Eurasia collision, and the development of the Himalaya and Tibet. The transect will constrain the Neogene development of the Asian monsoon, its impact on sediment supply and flux, and allow quantitative studies of the interrelations of climate change and sediment accumulation. Sediments obtained will document (1) uplift history through erosional flux and deposition patterns and detailed geochronology of minerals, (2) Himalayan evolution from isotopic tracing of particle origin and age, and (3) environmental and climate conditions through sediment granulometry, mineralogy and geochemistry, organic matter composition and oxygen isotopes of microfossils. Mobile alarms, oh, it is already 23:20. ‘Wake up’, mind strikes and forces me to get up from the bed. After taking shower, I prepare my backpack for next 12 hours working shift. My roommate, who is working in an opposite shift, is going to be here anytime soon for next twelve hours. After finishing all my morning ‘rituals’, I climb up stairs with full of enthusiasms to go to the core lab where we sedimentologists describe cores. On the core lab, archive half comes on ?core describing table and working half goes to sampling table after splitting the core into two halves. Designated samples are taken from the working half by allotted scientists. The first task on the archive half is to scrap off the sediment surface gently with stainless steel plate to make the surface smooth and visible for scientific observations. Then it is taken for high resolution imaging and magnetic susceptibility as well as spectral reflectance measurement. 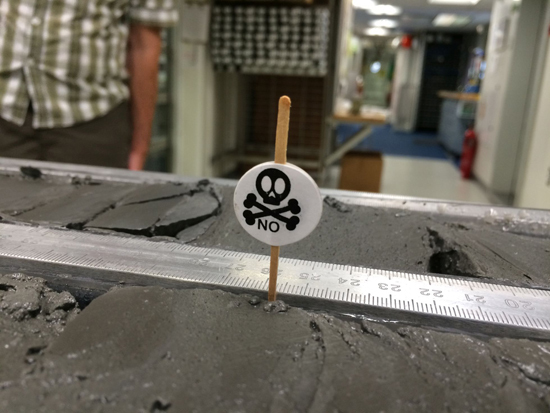 After which it returns to core describing table for further description of the sediment. We enter information about sediment types, characters, structures and drilling disturbances (if there are any) in a software called DESClogik. In JR we have our own small world floating on huge water-mass of the Indian Ocean. In this small world, people from different continents and cultural perspectives are living harmonically in cordial environment as a big JR-Bengal Fan family. Defining day and night in our JR family is quite different due to different working shifts. Every scientist works for twelve hours, from mid-night to noon and from noon to mid-night. In the very first days onboard, it looked very funny because at the same time one was taking dinner while the other was having breakfast. As, I am in mid-night to noon shift, I take breakfast at mid-night, lunch at six in the morning and dinner at noon. It took about a week for me to get adapted with this schedule. Wide varieties of meal are prepared by excellent cooks on board. As a vegetarian I am enjoying great vegetarian foods. Now, we are in middle of the Bengal Fan and it is already three weeks that we left Singapore and saw land last time. After a couple of days transit we started drilling our first site MBF-6A (U1449) down to 213 meter below the seafloor with quite good sediment recovery. 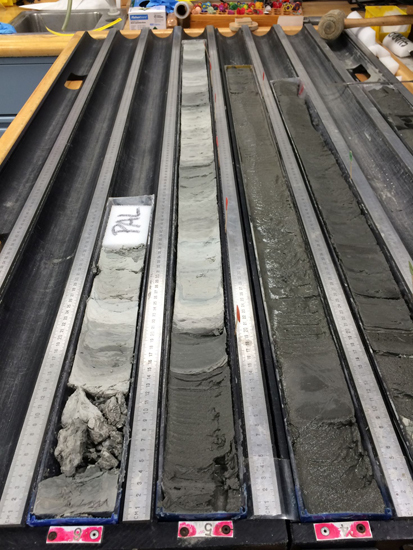 We drilled further deep into the sediment at the second site MBF-2A (U1450) reaching about 690 meter below the seafloor. Now, we are drilling third site MBF-3A with our ambitious depth of 1500 meter below the seafloor. 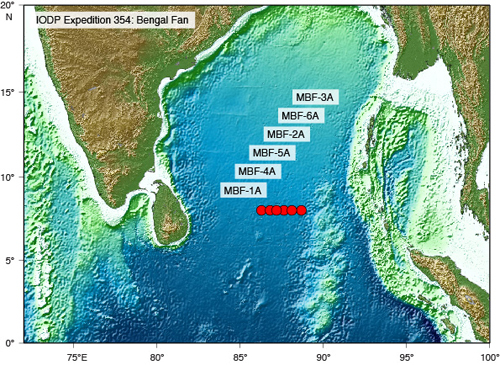 We all onboard are enthusiastically waiting to meet that depth of drilling in order to decipher mystery of the Himalayan evolution, impact of the monsoonal system on sediment supply and development of the Bengal Fan. Working halves on sampling table. Sunrise seen from JR on 24th Feb, 2015.